Shooting in right at the top of the hotly contested tablet PC category, the Motorola Xoom is a tablet to look out for and offers some strong competition to the iPad and the Galaxy Tab. Larger than both the Samsung Galaxy Tab and the iPad the 10.1-inch Xoom from Motorola it also packs a lot of the hardware features that the Apple gadget lacks – cameras for example. It has a 5megapixel back camera with flash, and a front-facing 2megapixel one for video chat. Nice. It runs on a dual-core 1GHz processor and will ship with a 3G radio for wireless broadband to start, but can be upgraded to 4G Long Term Evolution through a hardware modem swap later this year. 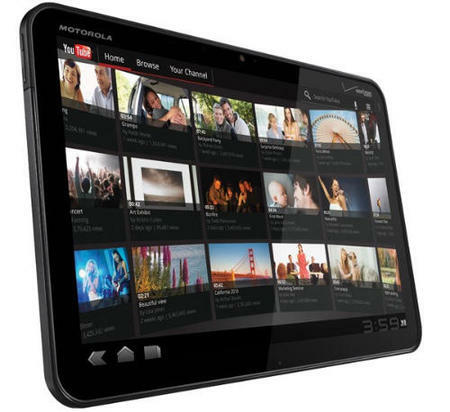 Awesome, Gratitude for sharing a extreme information here, The Motorola Xoom tablet is greatly best than other because it comes with pronounced features and functions, which is greatly best than other. I recommend everybody can buy this tablet.